My momma’s best-on-the-planet Rum Cake was always the most requested dessert for Mother’s day, and, yes, we made her bake it (before you get mad, please know that you can’t pull an Italian mom out of the kitchen, ever, even on Mother’s Day). But this year, we decided to let her off the hook and make something she’d never had before. 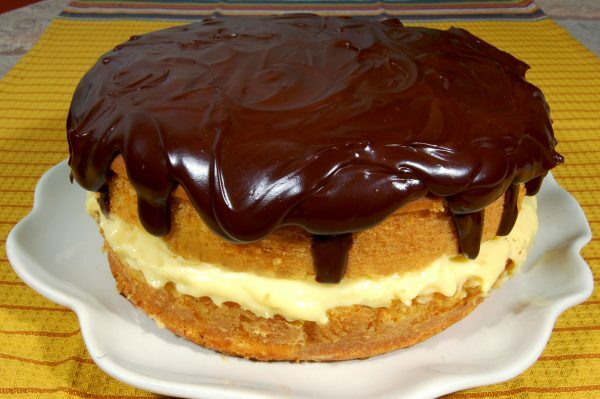 For some reason, the beautiful Boston Cream Pie with two layers of cake, pastry cream, and chocolate glaze dripping over the top and down the sides, was never included in any of our special occasion menus. We’re making up for that now! Happy Mother’s Day, beautiful moms! Preheat oven to 350ºF. Grease and flour a 9" round cake pan, preferably a spring form pan. In a large mixing bowl with an electric beater, blend together the cake flour, sugar, baking powder, salt, milk, shortening, eggs, and vanilla at low speed, scraping the bowl often for about 1 minute. Then, on high speed, beat for about 3 minutes, scraping the bowl occasionally. Pour the batter into the prepared cake pan. Bake for 30-35 minutes, or until a toothpick comes out clean from the center. Remove from the pan and let cool. Then, place the cake in the freezer for about one hour to harden, making it easier to slice through (freezing is optional). In a 2 quart saucepan, mix the sugar, cornstarch, and salt. Stir in the milk gradually, and cook over medium heat, stirring constantly, until the mixture thickens and boils. Boil and stir for 1 minute. Stir at least ½ of the mixture slowly into the egg yolks (tempering). Return the egg yolk mixture to the saucepan and boil and stir for 1 minute. Remove from the heat and stir in the vanilla. Let cool to room temperature. In a medium saucepan, heat the chocolate and butter over low heat until melted. Remove from the heat and stir in the powdered sugar and vanilla. Stir in the water, a little at a time until the glaze is of desired consistency. Slice the cake in half horizontally to make 2 thin layers. Place the bottom layer on a large serving plate. Spread the filling over the cake and top with the second cake layer. Spread the chocolate glaze over the top, letting it pour over the sides. Let the glaze set for about an hour before slicing. Keep the cake refrigerated after serving.